The 9th U.S. Circuit Court of Appeals has ruled that it is OK for NOAA Fisheries to keep killing some California sea lions preying on ESA-listed spring Chinook at Bonneville Dam. The action had been challenged by The Humane Society of the United States, which had already lost in federal district court. On Sept. 27, the three-judge panel sided with the feds and their interpretation of the term "significant impact," as in what effect the marine mammals have on the spring Chinook run, compared to dams and human harvest. In 2011, when the Niners reversed the feds' lethal authorization, the court had asked the feds to explain why the sea lions were being singled out, when other sources of mortality such as harvest and dam passage were higher. The feds included a 13-page explanation for their decision that has seemed to satisfy the court. The feds said they will limit annual lethal removal to a maximum 92 animals, and review the practice in five years when reauthorization is necessary. But NOAA has removed an earlier constraint that called for ending the practice if the sea lions' fish take reached 1 percent or less. In recent years, their impact on the spring Chinook run has declined to an estimated 1-2 percent range. According to the last weekly report on sea lion predation at Bonneville Dam, more California sea lions showed up than in 2012, but daily numbers were close to last year's, which were the lowest observed since 2002. The feds have estimated the West Coast population of California sea lions to be around 300,000 individuals, a substantial increase since the 1970s, when the Marine Mammal Protection Act was passed in 1972. 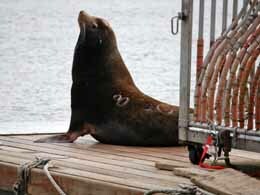 They said the California sea lion population has grown nearly 30 percent since 2007. The Niners' decision may also buoy defendants in the years-long litigation over the hydro BiOp, since it upheld a ruling by a relative newcomer to the federal bench in the District of Oregon, Judge Michael Simon, whose ruling favored the federal agency's interpretation of the law. Simon has taken over the BiOp litigation from retired Judge James Redden, and it seems likely the latest salmon plan will be headed back to court, after the latest version comes out by the first of the year. In his March 2013 ruling in the sea lion case, Simon wrote, "the Court concludes that NMFS has reasonably explained any apparent inconsistencies among its findings for two reasons: first, NMFS identified substantive differences among the applicable statutory standards, and second, NMFS identified relevant qualitative differences between the impacts caused by fisheries and the mortality caused by pinniped predation." Simon accepted the National Marine Fisheries Service's argument that "significant" had different meanings, depending on the statute involved, on whether it was the Endangered Species Act of 1973, Marine Mammal Protection Act or National Environmental Policy Act. He said plaintiffs did not recognize that the feds use differing standards for gauging adverse effects from harvest and sea lions, so the plaintiffs' argument comparing the two results was incorrect.